Welcome to St Kilda Beach! St Kilda is a bayside suburb. It is located on one of the more picturesque points of the Bay, just a short distance from the city. It has clean safe sandy beaches, despite formerly being known for the plentitude of prostitutes and druggies. St Kilda is a remarkable place which is a favourite for visitors to Melbourne and locals alike. One hundred years ago St Kilda was one of the most fashionable suburbs, with exotic huge mansions and guest houses being created. Mid 20th century it became was synonomous with crime, prostitution and drugs. but now with the massive increase in housing prices and the close proximity to the city St Kilda has become one of Melbourne's most fashionable suburbs. St Kilda is alive with development with new apartments, new restaurants, cafes, and a new exciting image. It is a mecca for tourists and Melbournians alike. Or just people watching. 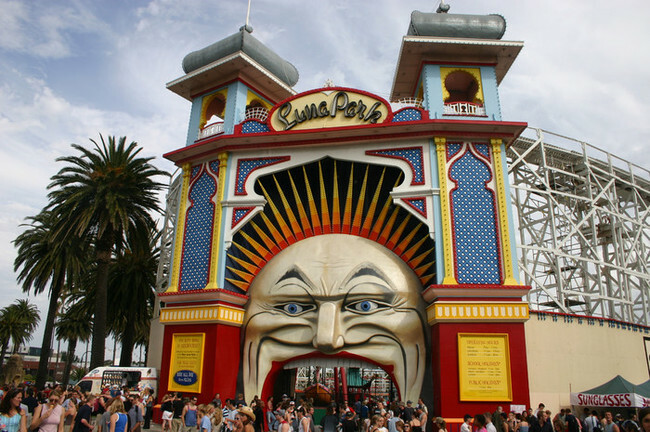 Luna Park is an old seaside amusement park with working wooden roller coaster and many other loopy rides. On Sunday St Kilda hosts an art and craft market along the Esplanade. The Espy hotel is there too, overlooking the beach. There is lots of night life, at places like the Prince and the George. Buy a $25 gift voucher for the BeachComber Cafe (at the St Kilda Sea Baths) - for only $2! 127 - George Public Bar - monday night trivia!